* PLEASE CHECK THE BOX BELOW TO CONFIRM THAT YOU HAVE READ THE RELEASE AND WAIVER OF LIABILITY AND TO ACKNOWLEDGE THAT YOU AGREE. 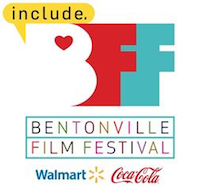 HAVE YOU WORKED AT A PAST BENTONVILLE FILM FESTIVAL? Are you a Walmart or Sam's Club Associate? Do you have a cell phone to use with texting capabilities? Are you able to work indoors? Are you able to work outdoors? Do you prefer public facing roles? Do you prefer behind the scenes roles? Are you able to lift/push over 10 pounds? How did you hear about volunteering (i.e. Sponsor, Social Media, etc.)? If you have worked at BFF in previous years, do you have any special requests for locations ? Do you have any additional skill sets that you feel would be helpful to share?